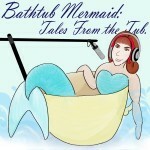 In which the Bathtub Mermaid shares a piece called “Mermaid Child,” written for the Summer Love Notes project. I could swim before I could walk, and before I was seven I was an expert in swimming out just far enough to find the warm current, sweeping my arm to make jellyfish float away, and body surfing into shore without ending up rolling in white water. I flew in the water. Music for this episode was provided by Mevio’s Music Alley, a great resource for podsafe music. Visit them at music.mevio.com. DDOP-15-02: Mermaid Child by Melissa Bartell is licensed under a Creative Commons Attribution-NonCommercial-ShareAlike 4.0 International License.